Each year during the last week of October, SPARC gathers activists, academics, librarians, publishers, archivists, and students to sing from the rooftops about the critical importance of open access efforts in all sectors and all corners of the globe. And of course IssueLab is glad to join in such good company for International Open Access Week! 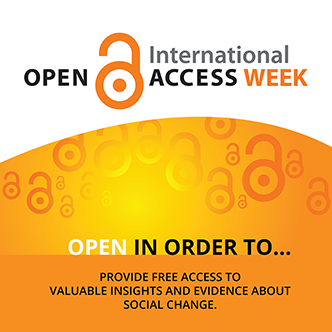 As principled pragmatists, advocating for the adoption of open knowledge in the social sector, we especially appreciate this year’s Open Access Week theme. “Open in order to…”. This year’s theme is not only a chance for us to articulate WHY IssueLab operates as an open repository for the social sector but it’s also a chance for us to invite you to do the same! As you start to formulate your own answer you might want to check out three blog posts that summarize not just IssueLab’s answer to this question but also some of the answers that both nonprofits and foundations gave us when we asked. These Nonprofits Make Research Openly Available, Here’s Why! We will also be tweeting, posting, and sharing news about Open Access all week, so don’t be shy … the open access movement needs you. Retweet, repost, and share share share. DON’T MISS OUR ONE PAGERS ON HOW TO OPEN UP YOUR ORGANIZATION!